The tragic crash of Southern Airways Flight 242 is a cruel story of destruction, mayhem, and death. 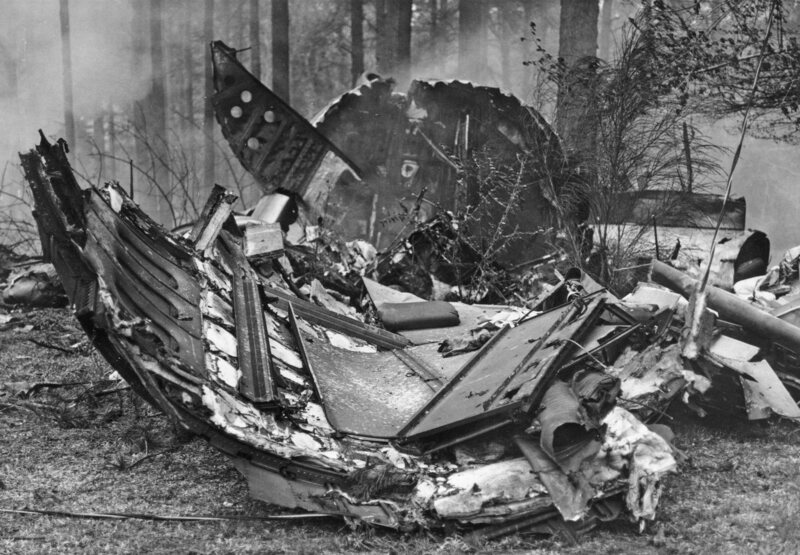 The captain died from his injuries, and the first officer expired while he was being medivaced to Kennestone Hospital. Twenty passengers died from fatal injuries due to severe burns and smoke inhalation, and 31 others were killed from crushing trauma to both the head and the upper body. Nine more passengers succumbed to a combination of trauma, burns, and smoke inhalation. The last victim lingered for over two months before he passed. 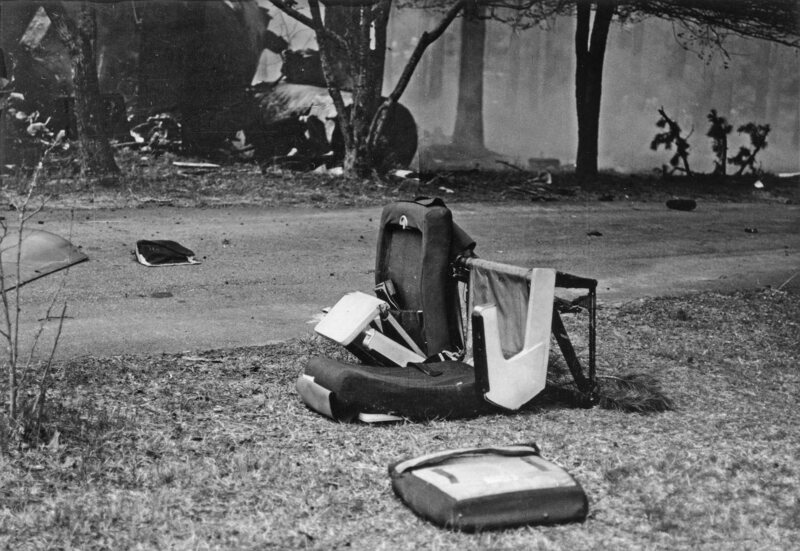 But there were also 22 lucky survivors, including both of the flight attendants – Catherine Lemoine Cooper and Sandy Purl. The survivors sustained a variety of injuries: most were burned about the head, face, hands, and lower legs. Three of them had serious back injuries. All of them spoke of an intense fireball that surged through the aisle of the plane as it repeatedly struck the ground before coming to a fiery halt. The wall of flames traveled from the front to the back, engulfing dozens of passengers before the DC-9 completed its destructive path. 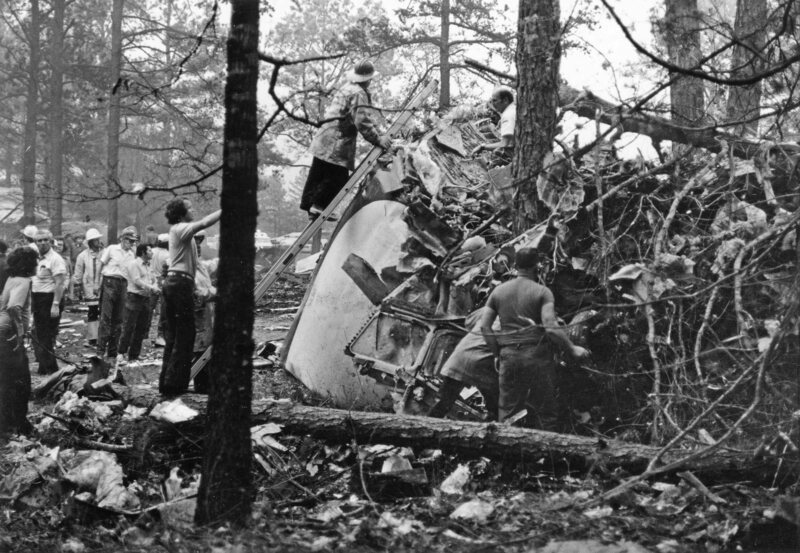 It remains the deadliest aviation disaster in the history of the state of Georgia. By the time Southern 242 came to a violent stop off Highway 92 Spur in New Hope, GA, it had broken apart into five sections and ignited into a raging inferno. A total of 72 people lost their lives, including nine unsuspecting victims on the ground. The flight crew had spent the night before the crash at the Holiday Inn in Muscle Shoals, AL. They left the hotel for the airport at 5:30 am on April 4, 1977, and arrived with just enough time for the flight attendants to have a quick bite to eat before they boarded the passengers. The pilots went right to work – they were scheduled to fly multiple legs that day between Atlanta, Huntsville, and Muscle Shoals, as well as Albany and Valdosta. The initial flight back to Atlanta was turbulent, with intense thunderstorms present throughout the entire area. According to the National Weather Service, the storm system that crossed northeast Alabama and northwestern Georgia that day was one of the most severe and fast moving weather systems ever recorded, and included an estimated 20 tornadoes and 30 severe thunderstorms. It was so rough that the captain ordered both flight attendants to remain seated during each leg of the flight. Southern Airways Flight 242 departed Muscle Shoals at 3:21 pm on one of the last legs of the day. It was a 20 minute flight to Huntsville, and the new passengers quickly boarded. At 3:54 pm they departed Huntsville for the 25 minute trip to Atlanta. The plane ran into immediate turbulence, which only worsened as the flight progressed. Ten minutes into the trip they encountered a heavy hail storm, and shortly afterwards the aircraft lost thrust in both engines. The co-pilot was unable to find a suitable runway, so he was forced to make the disastrous forced landing on that narrow strip of highway in New Hope. Senior Flight Attendant Catherine Lemoine Cooper, 26 years old at the time of the crash, suffered only minor injuries. Two weeks after the deadly accident she sent a hand written statement detailing her traumatic experience to the National Transportation Safety Board. She quickly resumed her duties at Southern Airways, and almost 40 years later she is still working as a senior flight attendant, now for Delta Airlines. I recently asked her to review her NTSB statement from April of 1977. Afterwards, she seemed truly surprised that she had “forgotten” so many of the details. When I asked her to let me post her statement, she quickly agreed. Thank you, Catherine. The strength and courage you demonstrated on that tragic day is an inspiration to us all. About 20 minutes after leaving Huntsville, AL we encountered a severe hailstorm. It was so loud I couldn’t even hear myself speak. The plane seemed to be suspended in midair with no feeling of turbulence. Then I felt a change in the cabin pressure and I knew that the hail had broken through somewhere. Suddenly, the cabin lights went out for 1-2 minutes, but then came back on. The emergency lights were on while the main lights were off. Also, the oxygen masks did not fall after the decompression. We slowed down considerably and the plane seemed crippled. It felt like we’d lost an engine. I looked into the cabin aisle and saw Sandy on Row 11 giving emergency instructions. I started back to ask her if the crew had somehow spoken to her and instructed us to prepare for an emergency landing, but I changed my mind and immediately began my own preparations for an emergency. I picked two buddies to help me with the slide, two buddies to check on the crew, and then briefed everyone on their exit. I told the passengers to put up their seats and tray tables. I told them to take off their glasses, dentures, and shoes, and to stow everything under their seats or in the seat pockets. I explained how to assume the crash position when the pilot flashed the no smoking/fasten seatbelt sign. No one panicked or questioned anything – everyone did exactly as they were told and prepared for an emergency evacuation. I told the passengers I really didn’t know what was wrong, but I wanted them prepared for anything, and to be ready for the worst. Then I went up to the galley and forced a serving cart on the cockpit side of the galley back into its locked position. It had one small fastener which popped off easily during takeoff, causing the cart to roll out and completely block the galley door exit. We had not used that cart or touched the catch during the flight, yet it had still popped off during takeoff. The flight was too rough before the hailstorm to try to force it back, and I was going to wait until we started our descent because the cart is extremely hard to push backward due to its brake. I took anywhere from 30 seconds to one minute to secure it. After that, I opened the cockpit door to tell the crew that we were prepared for an emergency landing. Lyman immediately screamed for me to sit down. I left the door unlocked to aid in evacuating the crew if necessary. I sat down and rang three bells for Sandy. I told her the front windshield was shattered, and she told me that both engines were out. Then she asked if I had taken off my hose and shoes. I said that I was taking them off, and planned to stow them in the galley. If I stowed the items behind my seat, I was worried they might cause a blockage during evacuation. I told her I would see her later, and hung up. I put my shoes and hose deep in a section of the cockpit side of the galley reserved for the ovens. I also had my purse and loose paper towels there so they wouldn’t interfere with the usage of the galley exit. After sitting down again, I wanted to get the interphone and a pillow to brace my head. Somehow, I knew I didn’t have the time and stayed seated. Suddenly, I heard Sandy begin screaming “Grab your ankles!” but I saw no flashing sign from the crew. So I also started screaming “Grab your ankles and put your head between your knees!” The man sitting at 1c grabbed the coat closet instead because he was too large to grab his ankles. I told him, “No, grab your ankles!” and he did. I felt the wheels touchdown, and it seemed a bit rough. Then I felt the plane bounce back up into the air, followed by a hard crash into the ground and a sense of being thrown sideways to the co-pilot’s side of the plane. There was another hard crash followed by total darkness, and after that I was violently shaken every which way for what seemed like an eternity. When I finally came to a rest, I was hanging upside down by my seat belt in a part of the plane I didn’t even recognize. The door had somehow moved from the right side of my body to the left side. I couldn’t open it, so I climbed through a crack into an area filled with electrical equipment. The equipment was sissing and popping, and I expected it to explode. I tried to climb up to a hole in the roof, but I slipped back twice. I made it the third time because I was determined to get out. I climbed outside and came up against a pine tree. I had to jump 6-7 feet. Normally, I’d try to fall gradually to reduce the distance I actually dropped. Instead, I jumped regardless of injury because I expected the section I was in to blow up at any time. My training was to get away from the plane immediately, which I did. I could see several badly burned people staggering up a hill to a house. My driving need was to get help and find a phone to call for ambulances and the firemen. People were screaming and crying and wandering all around the crash site. Most of them made their way up to the house. When I finally got up there, the phone was out and there was no water. I was frantic to help the burn victims, but without any water I couldn’t think of anything to do. I sat down for a minute and watched the fire as more explosions went off. But I knew I had to get help, so I got up and hurried to another house where I saw an ambulance arriving. I directed them to one of the badly burned victims. Then a woman took me and another burn victim to the hospital. I was tagged and put out of the way until the most badly injured victims could be cared for. Sandy and I wandered around for two hours, trying to think and reach our families before they heard the news. We went to the emergency room once, but we were told to stay out of the way. Everyone treated us with such kindness and love that I can never thank them enough. There were no children that I can remember on board the plane. The remains of a Dodge Dart and Toyota Corolla in front of Newman’s Store. Seven people from one family were killed as they sat in the Toyota: Edna Gamel, 23, her 5-year-old son John and 11-month-old daughter Courtney; Kathy Carter, 18, and her 5-month-old son Jeffrey; and Faye Griffin, 22, and her 6-month-old son Larry Jr. This entry was posted in The Tragic Crash of Southern Airways Flight 242 and tagged Catherine Cooper, New Hope GA, Southern Airways Flight 242. Bookmark the permalink. This was a very sad day at Southern Airways. I will never forget the looks on peoples faces in the GO when the news came in. I was on a flight coming from San Juan after a quick turnaround “rum run” when I heard about the crash. The captain of the Eastern flight told the flight attendants they needed to tell the Southern employees in first class about what happened. I regret that the other girl and I didn’t go to the reservation office later on to see if we could help. The next day, I checked on the two men that I had worked so hard to get onto Flight #242 from #249 later in the day. I had split their reservations into a two one-person reservation, and they had both cleared the waiting list and were on Flight #242. They were pleased because they were trying to make connections to a flight going home to New York City. Sadly, they were both killed in the crash. I was 16 years old and home alone when an official from Southern Airways called to let my family know that my Dad was one of the deceased on the flight. What a very sad time it was for me, my five siblings, and most of all, our Mom. Cathy and Sandy both did an amazing job in the aftermath of the crash, and I am so thankful that their lives were spared that day! This was a sad day for all of the families of the fatalities on the plane, as well as for the families of the nine residents of New Hope who were killed on the ground. One of them was my Great Aunt Berlie Mae Craton. She was killed in the front yard of her sister Ruth Bell’s house, who was also her next door neighbor. I am the president and one of the founding members of a non-profit corporation, New Hope Memorial Flight 242, Inc. Our organization is dedicated to preserving the memory of the victims and to celebrating the lives of the survivors. Please join us on Saturday, April 2, 2016 at 11:30 AM at New Hope First Baptist Church, 31 Bobo Road, Dallas, GA for the annual memorial service and survivors’ reunion. We will unveil the architectural plans and building specifications for the planned memorial monument to be built in New Hope. I am trying to get in touch with you, Cherry Waddell. I was present in New Hope that day, and I plan to be at the 40th year memorial service for the first time. As a former flight attendant, I got chills reading this detailed account. We must never forget those who went too soon! On the Friday before the crash, this crew picked up the aircraft that I brought into Memphis – on Monday, the crash happened. To this day I can remember seeing the crew, chatting with them and glad to see everyone. I flew many times with Lyman on the Martin 404. Happy times and happy memories! Then on Monday we got the news of the crash. Everyone was on pins and needles waiting to find out who the crew was. While I was greatly saddened by the loss of life for so many, I was happy to know that Cathy and Sandy had been spared. It was a very traumatic time for everyone at Southern Airways. I am so proud that I can count Cathy as one of my very best friends for over 30 years now. She is a real trooper, and willingly and calmly explains this story to anyone who asks her. Flying with her is fun because she can make me laugh at the goofiest situations. She is my personal hero and she knows I love her to death. Hello John – I am a former flight attendant writing a book about flight attendant survivors and their bravery. I would dearly love to get in touch with Cathy and be able to print her story in my book. My name is Brenda Chabot. My number is (519) 943-6343, and you can also contact me at info@canadianclass.com. I want to honor all of them for eternity. Thank you.